Ah, the jewel beetle, our old friend! 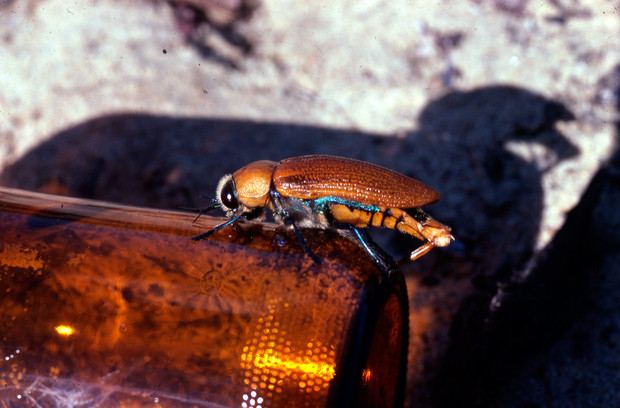 In case you don’t know, in Australia there is a species of beetle whose males enjoy fscking beer bottles. Turns out the brown glass reflects light in the same way the female beetle does. The bottle is like 3 times the size of the female, but it turns out males think big=hawt, so they go crazy over the bottles, so much so that they actually die in horrendous ways trying to fsck the glassy thing. This is SCIENCE!!! It is very easy to compare jewel beetles to Real Dolls™, but i think an even better comparison is with music, in that we feel music as if it carried true feelings and not messages about feeling. And this mistake is bigger than it seems. In prep of tomorrow’s post, because i talk a lot about carnaval there but i don’t really know so much about carnaval, i’m literally a novice at the thing, but i felt my perspective could be really useful and i just want to say why.